Director Gianni Dubois (Silvio Orlando) hasn’t made a film for five years. Now a hot young TV actress (Cristiana Capotondi) wants him to help her break into movies, giving him a chance to get back in the game and make some money so his agent doesn’t have to keep paying his bills. But he can’t think of a single good idea and she is piling on the pressure. As bad luck would have it, damaged pipes at the little apartment he owns in a Tuscan village choose that week to burst, destroying a 17thC fresco in the church next door. 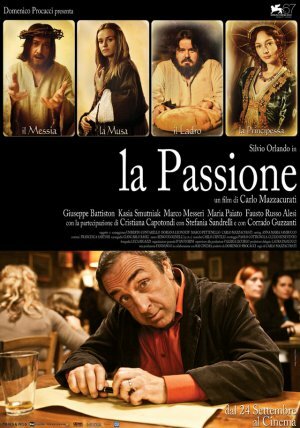 He is summoned to the village to sort it out and instead of paying for a restoration is blackmailed into directing the town’s Passion Play for Easter. He has one week to rehearse, no professionals to help him, a crazy actress en route to hear his “brilliant pitch”, a fake broken leg and Jesus has quit in a huff.